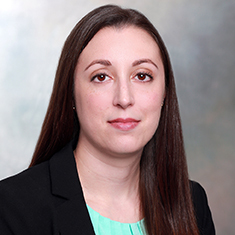 Alissa Pacchioli is an associate in the firm's Intellectual Property group. Alissa focuses her practice on patent litigation under the Hatch-Waxman Act, with experience representing both brand and generic pharmaceutical companies in district court litigation. Her practice also includes working with experts and drafting reports, preparing for and taking depositions and drafting pre-trial orders. She represents a range of pharmaceutical companies in both patent litigation and inter partes review. Alissa also has significant experience with opinions, IP due diligence, licensing and prosecution in all areas. Alissa's scientific knowledge includes organic chemistry, dynamic combinatorial chemistry and polymer science. Her practice has also included patent prosecution and application drafting relating to chemicals, small molecule pharmaceuticals and consumer products before the US Patent and Trademark Office and foreign patent offices. Before law school, Alissa obtained her MS in organic chemistry and conducted research on dynamic combinatorial chemistry and fluorescent sensors. As an undergraduate, she conducted research in polymer science, including atomic transfer radical polymerization. Shown below is a selection of Alissa’s engagements.